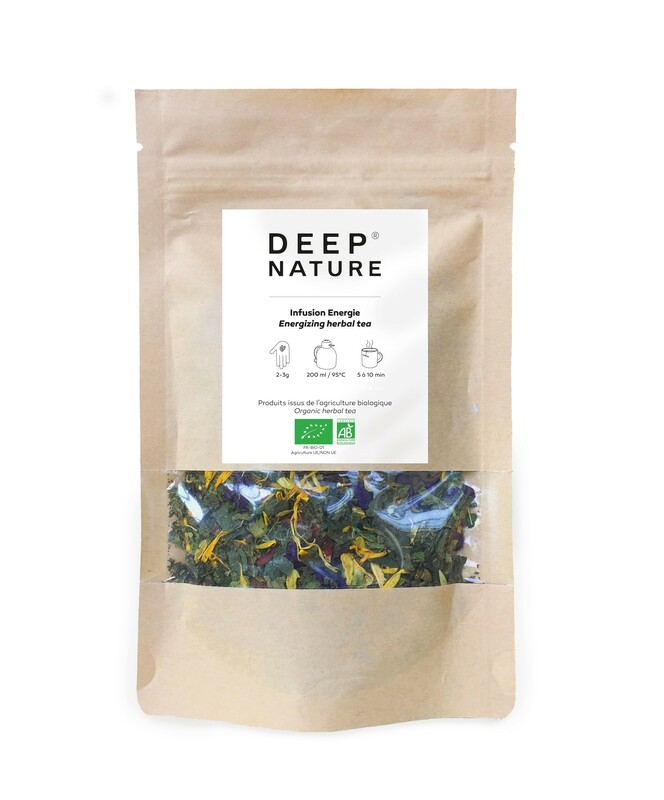 Deep Nature’s Energising herbal tea combines plants which have stimulating benefits Ingredients: mint, cinnamon sticks, hibiscus*, liquorice root, ginger, fennel, orange peel, clove, camomile, pink peppercorns, cardamom. The energising herbal tea is a natural way to give yourself a boost when you’re feeling tired. (In addition to regular hydration and healthy food). Mint and cinnamon are known for their energising properties for the body and the liquorice and ginger will stimulate you and help you to fight tiredness. Ingredients : mint*, cinnamon sticks*, hibiscus*, liquorice root*, ginger*, fennel*, orange peel*, clove*, camomile*, pink peppercorns*, cardamom*.